Trec Glucosamine is a preparation intended for daily supplementation for people who want to protect the osteoarticular system against degenerative processes and struggle with pain caused by inflammation and destruction of articular cartilage. The active substance has been placed in easy-to-swallow capsules, thanks to which comprehensive support of the movement system becomes even simpler and more convenient. 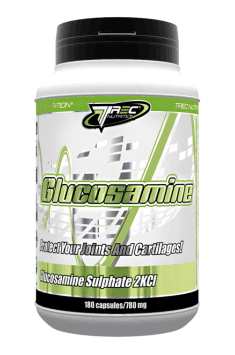 Glucosamine sulphate is a glucose derivative that contains an amine and a sulphate group, making it available in the best absorbable form. Glucosamine participates in the synthesis of collagen - the most important building protein for connective tissue, which supports the renewal of the connective tissue elements of the joint apparatus. Regular use of glucosamine contributes to the renewal and reduction of the occurrence of inflammation of the joints and cartilage, which has been confirmed by numerous studies. It is generally agreed that one of the signs of life is the ability to move. A man can move thanks to healthy osteoarticular and muscular systems. The motor system often degenerates in the old age or if it is overstrained. Osteoarthritis is one of the most common diseases that significantly reduces the quality of life. It affects not only the articular cartilage, but can also impair the functioning of the connective tissue ligament apparatus. Therefore it is worth taking care of the whole system by appropriate supplementation. Collagen is one of the most important proteins of the connective tissue. Its biosynthesis consists of a few important and complicated phases. Therefore it is clear that deficiency of any substance necessary to produce collagen will result in weakening the structure of its constituents. It is possible to prevent such situations, for example by including glucosamine in your diet. Studies have shown that it is one of the precursor substances in the synthesis of collagen, because it is a part of the N-acetylglucosamine, keratin and hyaluronic acid that builds it, which contain glucosamine in high concentration. In addition, it was observed that glucosamine enhances the synthesis of proteins that are components of synovial fluid. Therefore, it contributes to the reduction of friction between articular elements and also delays the development of osteoarthritis. Diseases of the osteoarticular system are often divided into processes occurring with or without inflammatory states. This is particularly important when it comes to treatment of given units, and also allows the administration of appropriate supplementation. Intra-articular inflammation is a phenomenon in which the inflow of immune cells occurs. They secrete various substances harmful to joint cartilage - free radicals and proteolytic enzymes, leading to its resorption. Joint area becomes reddened and warm, but most of all, you experience strong pain that prevents you from doing everyday activities freely. This is caused by pro-inflammatory cytokines, which include IL-1 with destructive activity for collagen. It has been shown that glucosamine supplementation can successfully alleviate the existing cartilage inflammation. Glucosamine inhibits the secretion of IL-1, which additionally leads to a decrease in the activity of cyclooxygenase-2 (COX-2) - an enzyme ‘silenced’ by many popular anti-inflammatory drugs from the NSAID group. Thanks to this, it is possible to reduce resorption and repair the cartilage by resuming collagen synthesis. Muscles are the second component of the motor system. Although muscle soreness occurs much more rarely than joint aches, it can be equally onerous. Fortunately, appropriate supplementation is able to compensate for the discomfort experienced in both cases. It has been observed that people suffering from inflammatory disease of articular cartilage are much less likely to experience post-workout muscle pain, provided that they take glucosamine regularly. Taking into account its comprehensive activity, it helps to regain almost full efficiency of the motor system. To sum up, Trec Glucosamine is a great supplement containing a high dose of glucosamine - aminosugar, which comprehensively supports the renewal of cartilage, connective tissue elements and limits the development of inflammatory processes within the affected joints. Take 1 capsule 3 times daily, preferably after a meal. Glucosamine demonstrates its effects only after 3-6 months of systematic use. To increase the effectiveness of the preparation, it may be joined with e.g. chondroitin or Boswelia serrata extract. Anti-caking agent (Magnesium salts of fatty acids), Capsule shell (Gelatin; Coloring agent - Titanium dioxide).